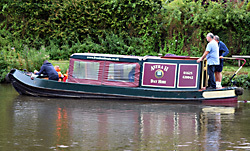 Astra II is a 26 foot long narrowboat especially designed for a lazy day out for a beginner or an experienced boater. Whether for a family holiday, a works party, an anniversary or birthday, Astra is just right for an enjoyable, lazy day out. Astra comes equipped with drop down PVC sides to keep off the worst of the British weather. If you have any questions about boat hire please email us.